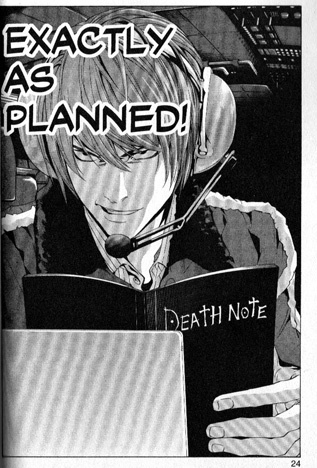 A random thought on Death Note and reality. Because of Palestinian violence before, the US and allies did not want to deal with a Palestine government until it became more democratic. Well, there was an democratic election, and Hamas, an anti-Isreal political party seen as a terrorist faction by the US, won. As a result of this, the US decides not to deal with Hamas and focus instead on Fatah, a more moderate political party. Hamas, realizing that the US and allies reneged on the deal, has now taken over the West Bank, and the brouhaha continues. I wouldn’t say that it’s really a conundrum, but it depends on what each person thinks.